Vacation apartment rentals in Rio de Janeiro on the beaches of Leme, Copacabana, Arpoador and Ipanema. Studios, one bedroom, two bedroom, three bedroom and four bedrom. In our apartments you will have freedom,, privacy, comfort, security and moderate prices. 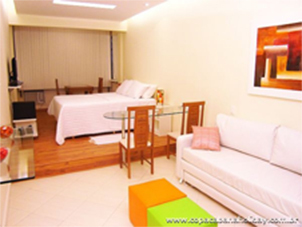 At Copacabana Holiday we have a full range of vacation apartments, all for moderate prices. Our apartments are situated along the world-famous beaches of Rio de Janeiro, namely Leme, Copacabana, Arpoador and Ipanema. Whatever the purpose of your trip - work-related, study, business, medical treatment, holidays, New Year's Eve or Carnival - please allow us to provide information on our equipped apartments in Rio de Janeiro and other services, as we are always keen to meet the needs and expectations of our clients. We provide prices on demand for your specific choice upon submission of the completed form available in • Booking information. In this way we give personalized service in line with all specific requirements to all who submit the form.